Fluid pressure inside the accumulator drops below the specification value. (c) Depress the brake pedal 20 times or more. (e) Wait for 99 seconds. (f) Check if the same DTCs are recorded. (a) Inspect brake booster pump power supply system function. (2) Depress the brake pedal 20 times or more to release the pressure in the accumulator. When the pressure is released, the brake pedal stroke becomes longer. (3) Check that the brake fluid level is at the MAX level. (4) Chock the 4 wheels and release the parking brake. (5) Turn the ignition switch to ON and measure the brake booster pump operating time (the time from when the brake booster pump starts operating until it stops). (6) Start the engine after the brake boost pump stops. (7) Check that the ABS warning light and slip indicator light are not illuminated. (8) Turn off the engine, and then turn the ignition switch to ON. (9) Check that the brake boost pump operates and then stops when the brake pedal is depressed 4 or 5 times. (10) Depress the brake pedal 4 or 5 times and measure the brake booster pump operating time (the time from when the brake booster pump starts operating until it stops). (11) Check that the brake warning light illuminates and the buzzer sounds when the brake pedal is fully depressed continuously 15 to 20 times. Wait 120 seconds or more after turning the ignition switch to ON before performing this inspection. (b) Check brake booster operation. (3) Depress the brake pedal, start the engine, and check the change in the brake pedal height. The brake pedal moves slightly inward. (c) Inspect brake master cylinder fluid pressure change (See page ). (d) Select the "Data List" mode on the Techstream. If value constant regardless of pump operation, accumulator pressure sensor malfunction suspected. (e) Check that the accumulator's output value is in the Normal Condition range. 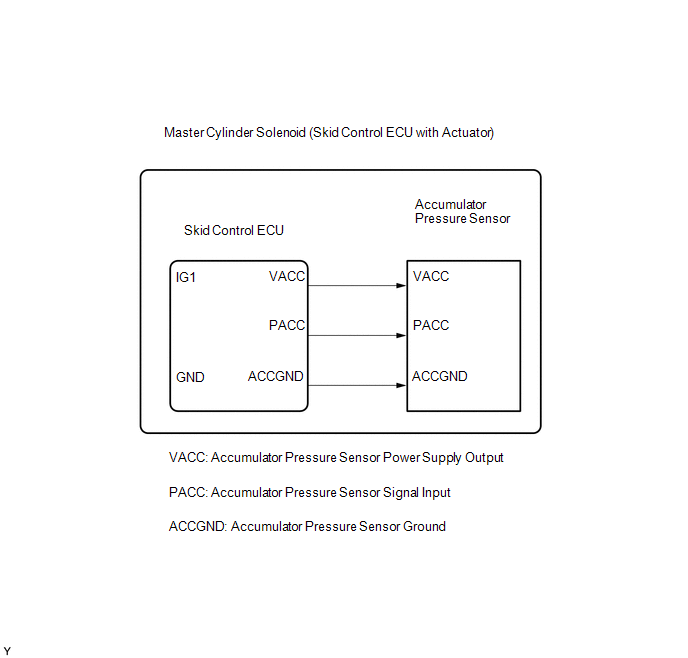 Accumulator pressure sensor value is in the Normal Condition. (b) Check if the same DTCs are recorded. 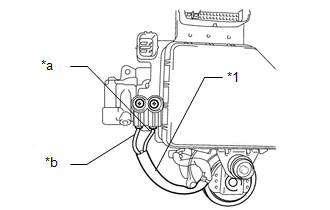 (a) Remove the hydraulic brake booster assembly (See page ). (b) Using a screwdriver, remove the 2 screws and pull out the wire harness from the master cylinder solenoid. (d) Install the pump motor wire harness to the master cylinder solenoid with the 2 screws.